All of the details about this week’s major update. The spring update for Battlefield 4 is now available, and we’ve got the full rundown on everything it does. EA and DICE had already revealed the spring update would bring with it new weapons and a new game mode, the latter of which you can now play on any of the game’s 10 base maps. But the patch actually does a lot more than simply introduce new content. It also rebalances a number of weapons (something DICE had provided some insight about previously), adjusts aspects of certain maps (resolving collision issues, changing how closely teams spawn to one another, etc. ), and deals with problems involving vehicles. You can see everything the patch does in the notes below, or check out a PDF that EA put together running down all of the changes. Fixed a situation where the player has an auto-throw gadget equipped in the left gadget slot and use it while holding the sidearm, the gadget will stay in the players hands. Fixed an issue where the stairs would disappear if players were revived on them. This would happen on multiple levels. Squad Obliteration: Fixed issue where a bomb that was forced reset could be “re-dropped” resulting in multiple bombs showing up. Squad Obliteration: Disabled round time extension. Now the round time will pause whenever a bomb is planted if time has expired instead of extending only if the score is tied or if the losing team plants a bomb if they are down a point. 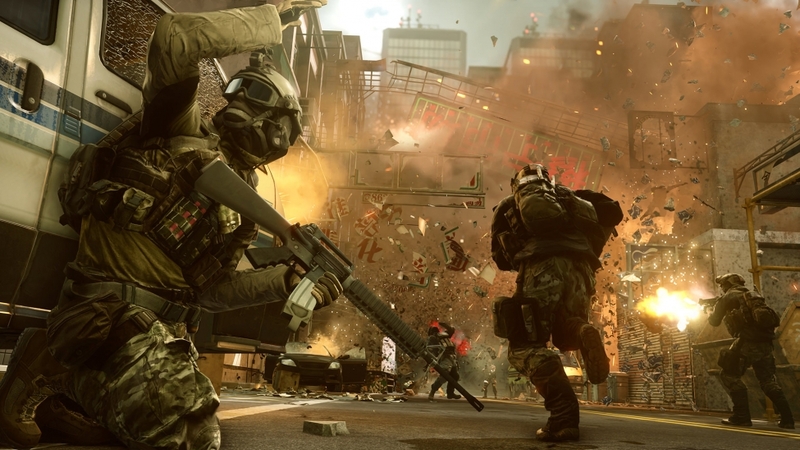 We’ve added stats to 49 existing dog tags including many favorites from BF3. Show off your skills! Enabled network performance overlay on Xbox One. It can be enabled/disabled in the menu options. Improved HUD clarity for red dot sights based on CTE feedback. Tweaked and updated the “Help me” icons (need ammo, need health etc) – icon now shows only if you can actually help. Fixed an issue where the grey vision present when a user is at low health is also present after the user exits a vehicle in which he regains his health. Fixed an issue with the ACOG scope where its leftmost bar stretched to a solid black block when aiming down sights. Fixed issues with the Belt Feeder/Autoloader not functioning on certain weapons. Fixed bug with flashbang that was preventing it from reaching intended brightness and duration. Fixed an issue where the destroyed dish parts would cause occlusion issues. Adjusted the TDM/SQDM/DOM, addressing issues with teams spawning too close together at the start of a match. Fixed a stone fence near the north edge of the map that was misaligned with the ground, making it appearing like it was floating. This entry was posted on Wednesday, June 3rd, 2015 at 11:57 am and is filed under Uncategorized. You can follow any responses to this entry through the RSS 2.0 feed. Both comments and pings are currently closed.